The Accenture World Match Play tournament is one of the most fun and exciting events on the PGA Tour all season, as the top players in the world gear up for a week of play that includes something different from all of the other tournaments they play every year. It’s a match play even versus a stroke play event, where players are paired up and play one-on-one against each other in a single elimination 64-player bracket. Perhaps sports fans in general might recognize the format similar to the NCAA basketball tournament in March and April. There are four brackets of 16 players, with four No.1 seeds all the way down to four No.16 seeds. But rather than the subjective nature of the college basketball tournament and how the seeding is done, the seeding for the Accenture Match Play is conducted purely based on World Ranking. The top-64 ranked players in the world automatically qualify, and if there are any withdrawals before the tournament starts than No.65 gets in, and so on down the list. There were two noteworthy withdrawals by players who will be absent, one of which would have been a No.1 seed. Brandt Snedeker, now ranked No.4 in the world, will not be in the field this week, after playing four-straight weeks and dealing with a minor rib injury he suffered at the Humana Challenge. That didn’t stop Snedeker from winning at Pebble Beach a couple of weeks later though. Also absent will be Phil Mickelson, who will be on a family vacation with his kids off from school. The No.1 seeds will be Rory McIlroy, Tiger Woods, Luke Donald, and Louis Oosthuizen. Oosthuizen is the No.5 ranked player in the world, and moves up a spot into the No.1 seed with Snedeker’s absence. McIlroy is the top-overall seed this week, and will face Shane Lowry, who like McIlroy, is from Ireland. Woods will match up with friend Charles Howell III. Woods and Howell played against each other in match play once, but that was back in 1996 at the U.S. Amateur with Woods winning. The Accenture Match Play starts on Wednesday of this week, a day prior to a normal PGA Tour event, because of the format to allow all five rounds to get in through the championship. 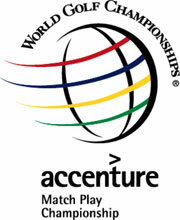 Woods is the favorite on WGC Accenture Match Play betting odds this week, installed at 10/1 to win. McIlroy is just behind, paying out 12/1. Hunter Mahan is the defending champion, defeating McIlroy in the championship match. This entry was posted in News and tagged accenture match play, betting odds, dove mountain, hunter mahan, rory mcilroy, tiger woods on February 18, 2013 by Bryan.